The Big Hole Valley & River Scenic Drive is a beautiful eighty-two mile excursion that takes visitors through one of the most beautiful valleys in Montana, the sprawling Big Hole Valley. Highlights of the drive include the beautiful Big Hole Valley, the Big Hole River, the unique town of Wisdom, and beautiful views of the Bitterroot and Pioneer Mountains. The southern starting point of the drive begins at the road junction of Highway 278 and the Pioneer Mountains Scenic Byway, to the east of Big Hole Divide and twenty-eight miles west of Dillon and Interstate 15. Initially, the drive climbs toward a low pass, Big Hole Divide. As the route drops down into the valley below, the views of the Bitterroot Mountains marching across the western horizon are superb. 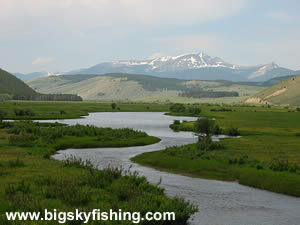 Once the route reaches the town of Jackson, the scenic drive starts roughly following the Big Hole River. The forested peaks of the Pioneer Mountains rise to the east, the snow-capped and rocky peaks of the Anaconda Range dominate the view to the north, and the Bitterroot Mountains flank the valley to the west. Overall, the ride between Jackson and Wisdom is an exceptionally scenic one. The town of Wisdom is, as might be expected, a very small one. However, it is a good place to pick up gas and other supplies, especially if the visitor will be heading out into one of the mountain ranges outside of town. Those with an extra hour to spare might also want to visit the Big Hole National Battlefield site that lies 10 miles to the west of Wisdom on Highway 43. The battlefield is an historic site and provides great views of the Big Hole Valley and surrounding mountains. More Information about Big Hole National Battlefield. Heading north from Wisdom, the Big Hole Valley & River Scenic Byway starts closely following the clear waters of the Big Hole River. The views along this stretch of road are excellent. Additionally, numerous fishing access sites, campgrounds and informal parking spots allow for excellent access to the river. Twenty-three miles north of Wisdom, the scenic drive reaches the junction with Highway 539, which is part of the Mt. Haggin Scenic Drive. Visitors with some extra time are encouraged to take a short side-trip for the first ten miles of this scenic drive, as the views of the Anaconda Range are superb. As the Big Hole Valley & River Scenic Drive heads east beyond the road junction with Highway 539, the route enters a canyon that is periodically broken up by small fields and meadows. Forested hills and mountains rise steeply above the river and the road. Despite this, though, the views are outstanding as the Big Hole River itself provides plenty of scenic sights. Once the route enters Wise River, the byway reaches the road junction with the northern starting point of the Pioneer Mountains Scenic Byway. Visitors whose travel plans will take them back toward Dillon should consider taking this byway - essentially making a loop trip - as it is a far more scenic alternative than plodding down Interstate 15. Overall, the Big Hole Valley & River Scenic Drive is a beautiful, paved drive that takes visitors through one of the most scenic valleys in Montana. 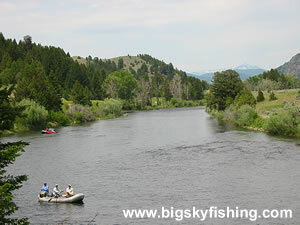 Additionally, anyone who enjoys fishing will certainly appreciate the easy access that the scenic drive provides to the famed Big Hole River. The map below shows the route and location of the Big Hole River & Valley Scenic Drive in Montana, along with several other nearby scenic drives. There are enough services along the scenic drive so that visitors won't be totally lacking for gas or other supplies. The town of Wisdom has a gas station and convenience store. The town of Jackson also has a few stores. Camping spots are abundant along the route. Several developed campground are located right along the drive near Wise River. Many more developed campgrounds can be found off the drive in the Pioneer Mountains and Bitterroot Mountains, particularly outside the town of Jackson. In terms of lodging, the best place to find a hotel room is in Dillon. However, there are a few scattered vacation resorts and lodges along the route. These places usually require advance reservations, though, and are often quite expensive. Dillon is the best bet to locate affordable one-night lodging. The Super 8 in Dillon, while not the greatest place in the world, is very affordable.